CALL (661) 323-5665 FOR YOUR ESTIMATE TODAY! Your Trusted choice for Bakersfield’s AC Repair, Maintenance and Installation Services. Rudy’s Air has provided quality AC services in Bakersfield and the surrounding areas. No matter what your AC needs are, Rudy’s Air has extensive experience in operating on all major brands. Your Trusted choice for Bakersfield’s Heating Repair, Maintenance and Installation Services. 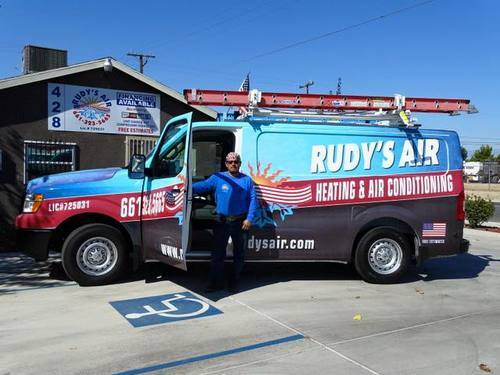 Rudy’s Air has provided quality Heating services in Bakersfield and the surrounding areas. No matter what your Heating needs are, Rudy’s Air has extensive experience in operating on all major brands. Your Trusted choice for Bakersfield’s Cooling Repair, Maintenance and Installation Services. Rudy’s Air has provided quality Cooling services in Bakersfield and the surrounding areas. No matter what your Cooling needs are, Rudy’s Air has extensive experience in operating on all major brands. Contact Us Today for Your Air Conditioning & Heating Needs!